Fudge babies are our family’s homemade version of Lara bars. They are simply chopped up dates, nuts, chocolate chips and a little bit of peanut butter to help hold everything together. These fudge babies are super easy to make and they are great for the kids to grab on the go. They are not too messy and they are a healthy, high energy snack. Really, these fudge babies are pretty much the perfect snack for a busy household. I usually keep a bunch of these fudge babies in the freezer. The kids know where to find them and they just help themselves. I grab them to go in the car and I throw them at the kids when they tell me they are hungry. If you buy the big box of dates from the refrigerator section at Costco, this is a great use for them. 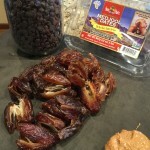 You can also make this recipe with dried fruit – such as prunes or dates. I’ve also done them with dried cherries and cashews – which is an fabulous variation on the recipe. The easiest way to make these is in a food processor. I get out my old Cusinart for this one, but if you have the food processor attachment for your Bosch, this is the time to pull it out. You can also do these in a blender, but you’ll be scraping down the sides a lot. The easiest way to make them is to start by pulsing the nuts in the processor until they are pretty finely ground. Then add the rest of the ingredients and chop everything up until it sticks together in a ball. If your mixture is still dry, then add another glop of peanut butter to help stick it together. This is our family's favorite grab and go snack. In the bowl of a food processor, pulse the nuts until they are a fine grind. Add the remaining ingredients and pulse until the mixture is uniform and sticky. Add extra peanut butter as needed to allow the mixture to stick together. 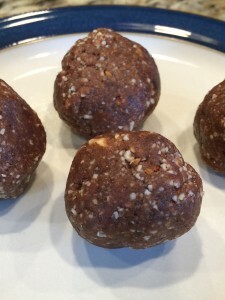 Shape into balls, or whatever shape you desire, and store in the freezer or fridge. Will keep for several weeks in the freezer, if you don't eat them first! I just tried the fudge babies recipe, bit didn’t feel lIke rolling into balls, so just pressed them into a 8×8 and will cut into squares. Yummm!! !